In recent years PlayStation 4 game developers have surprised gamers with their attention to detail. Insomniac Games is one of these developers. In September 2018 it has released a brand-new Spider-Man adventure – Marvel's Spider-Man. Let’s review the most amazing and hard-to-see details in this superhero action game. We’ll analyze not only the game’s special features and its accuracy but also character’s dialogues creation and citizens’ openness. If you’ve been interested in how Insomniac Games could create such a big city that doesn’t require a PS4 boot screen (except for the starting one), we have an answer: the game developers didn’t manage to do that since there was not enough PS4’s memory. In Marvel’s Spider-Man New York is parceled up into 800 sections, each 128 square meters. During the game, everything ahead of you loads and then unloads behind you. This was mentioned by the main game architect Mike Fitzgerald in his interview with the official PlayStation blog right before the release. Such way of creating the Spider-Man world provides ‘’a seamless transition so you’re always exposed to the highest detail level.’’ When Spider-Man moves really fast, each new tile loads every second but it looks so natural. Marvel’s Spider-Man team’s aim was to make New York and its skyscrapers more vibrant. So they created a simple but at the same impressive city architecture. When crawling up the buildings, you can even see the room interior. These rooms are basically the cubes covered with the textures, so it looks like a real interior. This is some kind of illusion: one corner room changes into another one when you look at it from the other side. What is more, there are not so many unique designs in this video game, so sometimes you can find two identical rooms which are next to each other. The team has spent a relatively small amount of time and money on creating this game. Just imagine how much work would it have taken to make all the rooms unique. But they still have managed to create a true-to-life cityscape. Spider-Man comes under rocket attacks as soon as the game starts. Normally you have to stay away from them but if you look closer at one of the rockets, you’ll see something interesting. Except the information listed on the rocket’s casing, you’ll find the lettering ‘’Guaranteed to Kill Spiders.’’ But actually, it’s not guaranteed to hit spiders. There is no fall damage in Marvel’s Spider-Man, and it doesn’t mean that each landing is identical to the previous one. It depends on how far Spider-Man drops. If he falls from an object which is a couple of meters tall, he’ll land on his feet almost without bending the knees. But if Spider-Man jumps off a taller building, he’ll have to land in a special pose. Sometimes he dives down onto the ground so hard that he can even crack the pavement. Spider-Man is believed to be a superhero who can’t exist beyond New York — the city that he protects. In Marvel’s Spider-Man ordinary people, the in-game Internet users and even J. Jonah Jameson react to Spider-Man’s actions. The protagonist can’t even wear his Spider-Punk suit without Jameson‘s comment. In-game Twitter users will also respond to him changing suits, and some people will even say that Spider-Man doesn’t really need them. Be ready to hear some unpleasant remarks from New York citizens when you land on their cars. And they become extremely annoyed if a guy in tight pants falls onto them from above. You can get the latest issue of Daily Bugle from newspaper vending machines on the streets. Each issue’s front page contains recent events, for instance, the arrest of Fisk or Shocker’s bank robbery. Nowadays, lots of people use smart phones for making calls and texting. Not every video game allows you to see a detailed phone interface throughout the game process. The Marvel’s Spider-Man developers made in-game devices display relevant information. 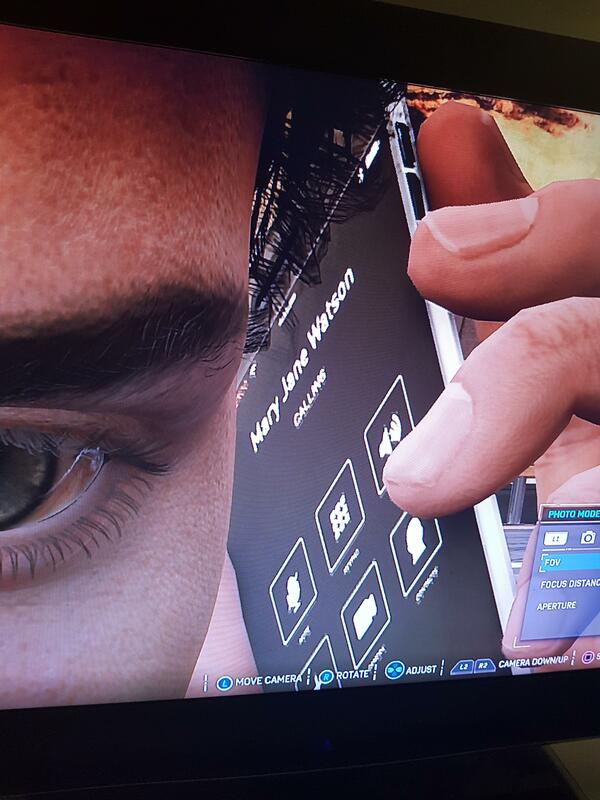 For example, if Peter calls Mary Jane, then the phone screen shows exactly her name. The same goes for text messages. You can not only see them on your game screen but also on the characters’ phone screens as it was on the MJ mission in the Grand Central Terminal location. Uncharted 4, another PS4 exclusive game, presents the same level of detail. Just imagine: you’re flying through the city, and your ex-girlfriend calls you. You’re talking about Demons and stuff, and you suddenly see a scuffle between the escaped prisoners and police-officers. Duty calls, and you must stop it. So the call disconnects. In Marvel’s Spider-Man such situations arise almost everywhere. The developers have created a special system that allows Spider-Man to come back to the conversation so you don’t have to listen to it again. When Peter calls a person back, he doesn’t restart the conversation but makes some comment on what they have already discussed. For example: “Sorry MJ, you were telling me about what you working on?”. Then the dialogue continues from the moment it stopped. This makes conversations between the characters more natural. However, this doesn’t apply to J. Jonah Jameson’s broadcast. It’s not that good as in Oxenfree but still it’s a nice try. Spider-Man spends much time in the air flying through New York streets. When someone calls him, the protagonist has to talk with a person while holding and swinging on the web, so it really effects his tone of voice and intonation. By contrast, Peter’s voice is calm and resting when he’s on the ground. Users have managed to learn that the developers recorded two different sets of dialogue. What is more, the intonation can change depending on Spider-Man’s actions (if he starts running or flying, for example). The team tried to get it working in the middle of a phrase but it’s not worth the effort. After completing Keeping the Peace main mission, Peter notices that his suit was damaged: ‘’Can’t have people taking pictures of my three chest hairs.’’ If you think that it’s just a little joke, you’re wrong. This is a real fact. You can make sure of it by seeing him shirtless through his Undies Suit (you get it after completing all missions in 100%). Spider-Man literally has three chest hairs.